Do you want a holster that is waterproof, scratch resistant and holds a shape? If yes, you should consider purchasing a Kydex-made holster. This type is popular because it offers gun carriers the best durable features. You too can be the owner of such a safety item. The article lists five of the best in 2018. Which one will you be a proud owner of? Concealment Express has established itself to manufacture holsters that match the designs and measurements of the different brands. This specific item molds well to any Smith and Wesson M&P Shield 9/40 & M2.0 pistols. The item features a Posi “Click” Audible Retention Lock System. A click sound is heard that informs you the holster is locked in place. You wouldn’t want your sweat to damage the gun. That’s why this holster has a sweat guard design to prevent any moisture from entering the holster. The Concealment Express Smith and Wesson M&P Shield KYDEX IWB Gun Holster has 3 available colors to choose from. It is easy to conceal wearing a thin shirt. This holster has a sweat guard design to protect or prevent moisture from entering it. The holster can at times conceal the trigger. The hard interior can scratch your gun and the edges are rough and tough that may dig into your skin. This gun holder is perfect if you have a Glock G19, 23 and/or 32. It’s specifically molded to these guns for an accurate and secure fit. This item provides great concealment because you wear it inside your waistband. Your pants, shirts and/or jackets provide maximum coverage. This item is comfortable to wear for long hours. It doesn’t put a strain on your back because it weighs only 2.5oz. The second and the third carry option must also be hidden inside your pants. This holster has a deep conceal design that it is comfortable to wear the entire day. You can also adjust the tension and the carry angle. The holster can scratch your gun due to it's design. The clip attached may break easily. The holster may warp in time and may no longer hold the pistol. This Concealment Express is an ideal solution to hide your Taurus pistol. Kydex is used to shape the holster to this specific gun brand. The holster has a basic design for lightweight carry and comfort. The different carry options let you accommodate the holster according to your clothes. This way different clothing items won’t expose your gun. The Concealment Express Taurus 111/140 Millennium G2 KYDEX IWB Gun Holster has a simple design that ensures your clothes don't outline the holster. The gun is held securely with it's locking system. The tension and chamber is also adjustable. The clip of this holster doens't have a firm grip on the belt. The safe switch may also be deactivated when drawing or removing the holster. Be cautious of as the edges are rough and which can dig into your skin. 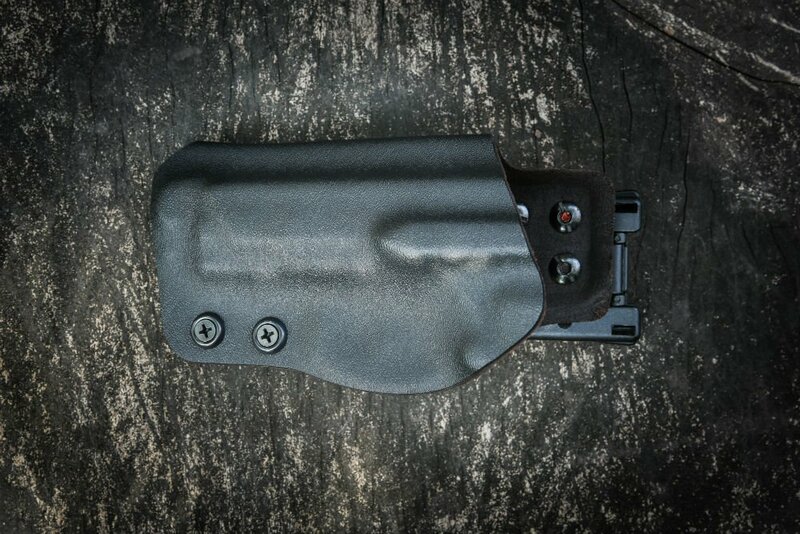 This IWB holster is specifically made for the Springfield XD-S3.3’’ gun. This is one of the best holsters for this type of gun because of the Kydex material. The material is durable for everyday use and the inner is soft to protect your gun’s finish. The construction material is a 0.08’’ Kydex which is ideal to mold the holster to the shape of the Springfield XD-S 3.3’’. You won’t feel tired or uncomfortable wearing the holster for hours because it weighs only 2.5oz. The clip measures 1.5’’ and it's best if you wear a belt that fits perfectly to that. When the belt matches the clip measurement it increases the chances of the holster staying fixed. You can place it anywhere on your waistband and it’ll be comfortable & fixed. One feature of this item that is beneficial is the Posi “Click” Audible Retention Lock System. When you attach the holster’s clip to your belt you hear a click. This click signals the holster is secured on the belt and won't detach. The Concealment Express Springfield XD-S 3.3’’ Gun Holster is a perfect for the Springfield XDS series. The tensions are quick and easy to adjust. The holster's clip is secure that it doesn't slide along your waistband. The holster doesn't seem to keep the gun secured. The inner material may be rough that it may scratch your gun. The retention screw can fall out. This hybrid holster is of the highest class from Outlaw Holsters because it’s made from the best materials for added durability and comfort. For more details check out our full review on this awesome holster. It’s a huge advantage to have a leather holster because the draw is quiet. This is important for emergencies where you need to be quiet. These two materials are also soft which makes the holster more comfortable to wear against your skin. This non tuckable (NT) holster is best worn against your skin and your clothes. You can’t tuck your shirts in your pants. When your shirts are untucked, it won't hug your body which is great because the holster is not outlined. This way the holster is more concealable. The holster stays in place that it molds to most guns. The material of the holster is comfortable to wear against your skin. The clip of the holster is not that tough and may break. The leather material can also stretch. The holster has also no retention. If you have multiple guns, then choose the NT Hybrid Inside Waistband Holster. It can mold to the shape of the different gun models extremely well. Best of all, with some pistols, it provides a tight fit for them not to fall out. Drop us a line below, and let us know what you think!